A private and peaceful location in the heart of Ao Nang. 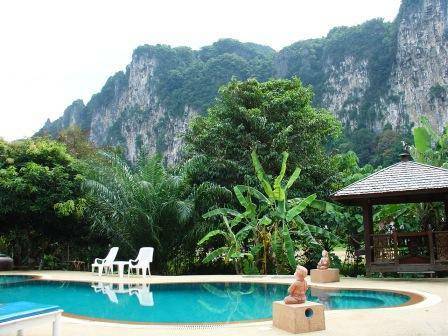 The Ao Nang Mountain Paradise is set amongst the beautiful limestone casts for which the Krabi area is famous and offers luxury and budget bungalows. A private and peaceful location in the heart of Ao Nang. 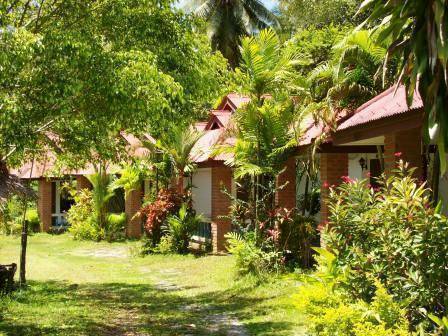 The Ao Nang Mountain Paradise is set amongst the beautiful limestone casts for which the Krabi area is famous and offers luxury and budget bungalows. All of this only a one minute walk from the main strip of Ao Nang and the many eateries, bars and activities available there. A short stroll down the hill you will find Ao Nangs main beach and from here you can take a longtail boat to explore the many islands situated in the bay. Scuba courses are offered as is rock climbing at nearby Railay or why not take a cooking class with one of the nearby cooking schools. The resort features a central pool and restaurant with surrounding bungalows and villas. 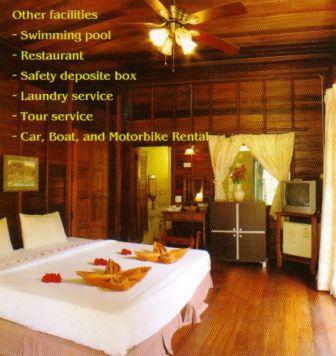 Thai Villa: Spacious, Double/Twin, fridge, air, cable tv, ensuite bathroom, hot water, balcony, traditional Thai design and styling. Superior Bungalow: Double/Twin, air, cable tv, ensuite bathroom, hot water, fridge, patio. Fan Bungalow: Double/Twin, fan, cable tv, ensuite bathroom, hot water, fridge, patio. Ao Nang was previously a small fishing village which has now become a bustling tourist destination. The town itself is surrounded by spectacular limestone casts which jut out from both land and ocean. There are many accessible islands in the bay including Poda, Hong, Chicken and Phi Phi islands. The customer shall forfeit one night's balance if cancellation is less than 48 hours before check in. The customer shall forfeit the full balance if a NO SHOW. 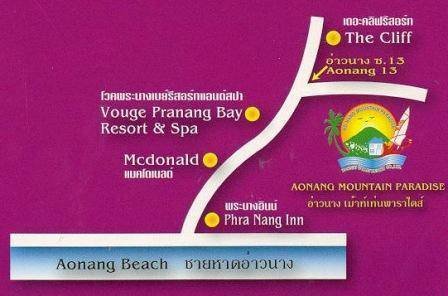 From the airport or Krabi town, buses and taxis are available to Ao Nang, taking 20-25 minutes. Should you require assistance getting here please do not hesitate to call. The resort taxi is available for pick up from the airport 600 baht, and Krabi town 500 baht. Please call ahead for this service.